Luxury comes to life like never before! 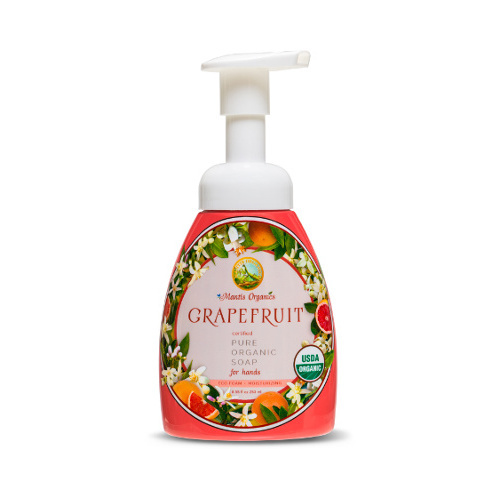 Mantis Organics’ Grapefruit hand soap is soft, creamy and deliciously aromatic, letting you indulge to your heart’s content. Leaving behind no greasy residue, this soap is infused with only the highest quality plant extracts. Exfoliate your skin for that long-lasting smell-good, feel-good finish! Aloe Barbadensls (Aloe Vera) Leaf Juice*, Cocos Nuclfera (Coconut) Oil*, Potassium Hydroxide, Helianthus Annuus (Sunflower) Seed Oil*, Citrus Slnensls (Orange) Peel Oil*, Citrus Paradisi (Grapefruit) Peel Oil*. Mantis Organics’ Grapefruit hand soap isn’t simply a cleansing agent; it’s a lifestyle choice. A lifestyle choice that lends itself to the health and happiness of the whole family.. Through careful testing, our experts have formulated a blend of the purest ingredients geared to nourishing and revitalizing pores for glowing skin. Restores skin’s pristine complexion organically through its emollient rich recipe, leaving your hands soft and supple. USDA Certified Organic, it contains no harmful chemicals, detergents, parabens or preservatives that lead to premature deterioration of skin cells. Luxuriously aromatic without the use of synthetic fragrances. It is infused with aloe vera leaf juice, grapefruit peel oil, sunflower seed oil and other essential oils to give your skin the very best care without compromise. Whether it’s hydrating dry skin or brightening dull skin, this all-natural foam is the perfect pick-me-up after a long, hard day.